www.photomacrography.net :: View topic - Calculating aperture diameter? 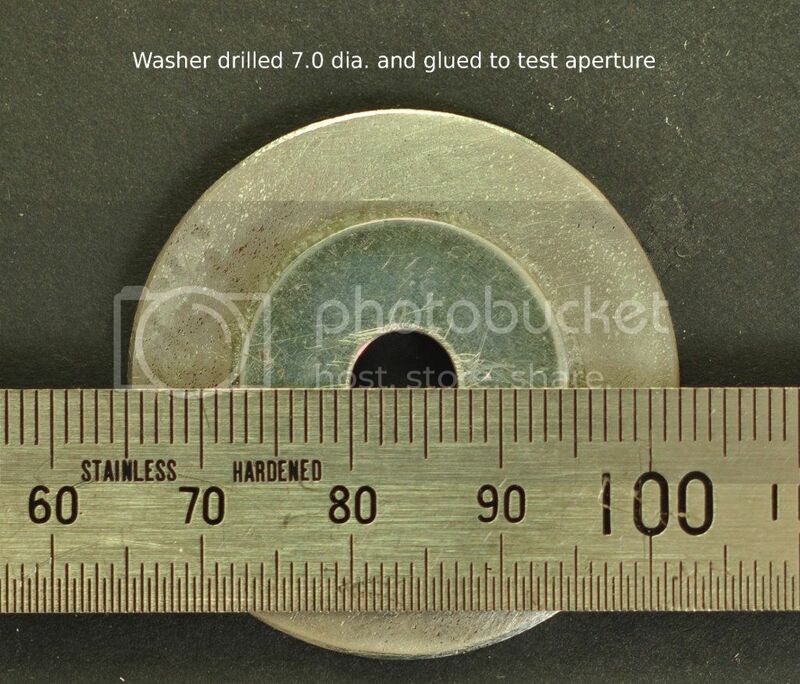 Posted: Wed Sep 19, 2012 7:24 am Post subject: Calculating aperture diameter? Can anyone tell me how to calculate the diameter of the aperture at f8 for a given lens? 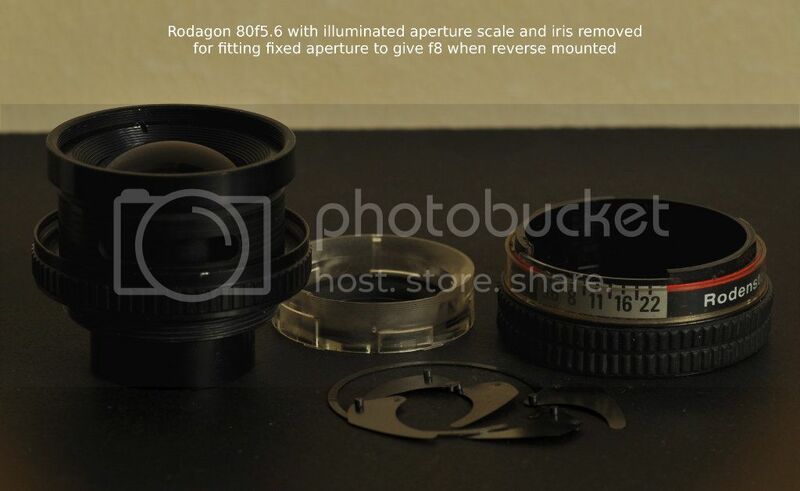 I have a rodagon 80mm f5.6 that has an illuminated aperture scale and a transparent plastic insert. What I am wanting to do is remove the iris and the plastic bits and fit an aperture disc that gives f8 with the lens reversed. I will then blank off the holes in the barrel. From what I have read, the calculation is not as straightforward as I thought. The iris is broken so I can't accurately measure the diameter at f8. I was under the impression it's part of the definition of f stop. Ie an 80mm lens with an f stop of 8 has a pupil diameter of 10mm ( 80/8 ). I gather from wikipedia there are exceptions though, so you're best off asking someone who actually knows for a fact/has one. Posted: Wed Sep 19, 2012 9:53 am Post subject: Re: Calculating aperture diameter? Correct, it's not straightforward. f/8 does not really mean that the aperture is 1/8 of the focal length. Instead, it means that the entrance pupil is 1/8 of the focal length. The entrance pupil is determined by the aperture, but there's a constant scaling factor caused by the magnifying or shrinking effect of whatever lens elements the aperture is seen through. The simplest way to get the diameter exactly right is to use a two-step process. First make a prototype aperture that is large enough to be easily measured but small enough that for sure it's determining the entrance pupil. Stick that into the lens and measure the resulting entrance pupil. Then scale the entrance pupil to f/8 (so 10 mm diameter in your case), scale the aperture diameter by the same factor, and make the final aperture. Since you want the lens to be f/8 when reversed, just be sure to make the measurement with the lens reversed also. More information about measuring the pupil diameter can be found in the FAQ about pupil factor, HERE. Does this mean that when you reverse a lens the apertures on the diaphragm scale are to be corrected by the pupil magnification ratio (if the PMR is 0.5 then 5.6 on the aperture ring means 8 with the lens reversed) ? 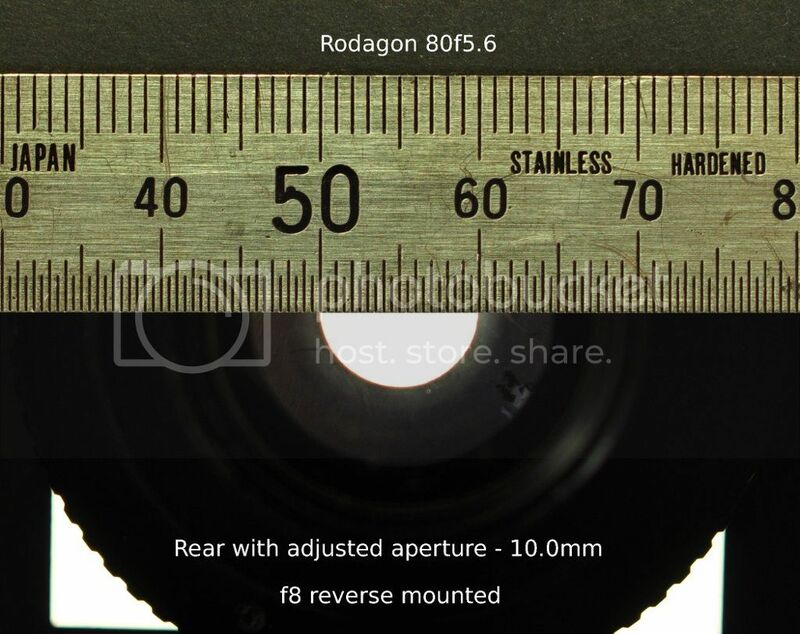 Yes, but since the PMR is based on diameter, a reversed f/5.6 with PMR 0.5 becomes f/11. It's interesting how these numbers play out with reversed lenses. When you reverse a lens and keep it at infinity focus, the f-number gets adjusted by the PMR. When you extend a lens to make it focus closer, the PMR also plays into how the effective f-number grows with extension. It turns out that these two effects partially compensate for each other, with the compensation becoming more complete at longer extensions and higher magnifications. To take a hypothetical example, suppose you have a retrofocus lens with FL 20 mm, f/4, and PMR=2. When you reverse the lens, it becomes f/2. "Great!" you say, "A wide aperture is just what I need for high magnification!" But now extend that lens to provide say 5X magnification. Because of the PMR, the effective f-number grows faster than the naive factor of magnification+1. Taking PMR into account, the effective aperture of that reversed and extended lens is f/22. This is remarkably close to the f/24 that you would have gotten with the naive calculation of 4*(5+1) based on ignoring PMR altogether. 1. Nominal f/4, PMR 2, using the "reversed" formula that f_e = f_r*(1/P)*(1+P*m). Then 4*(1/2)*(1+2*5) = 22. 2. Reversed "f/2", PMR 1/2, using the "front forward" formula that f_e = f_r*(m/P+1). Then 2*(5/(1/2)+1) = 22. The key intuition, at least for me, is that the f-number really specifies the angle of the cone of light. If a lens acts like f/4 when it's focused on a distant object and located close to the sensor, then "of course" it's also going to act like an f/4 lens when it's reversed and located close to the subject. The quotation marks around "Of course" allude to an old joke about mathematicians. There's this math prof giving a lecture. He gets to a certain point in the derivation, says "Of course it's obvious that...", and stops. He stares at the blackboard, rubs his chin, scratches his head, paces a while, and eventually leaves the room. 5 minutes later he comes back, resumes his place at the blackboard, and continues the lecture. "Yes," he says, "it is obvious..."
I wrestled with PMR for a long time before eventually that bit of intuition about reversal and high magnification came to me. Thanks Rik for your very clear explanation. I knew there were other factors at play but wasn't sure how to work it out. I'm not sure I fully understand the second part you posted though - I will have to ponder on that. No doubt it will be useful for future reference. 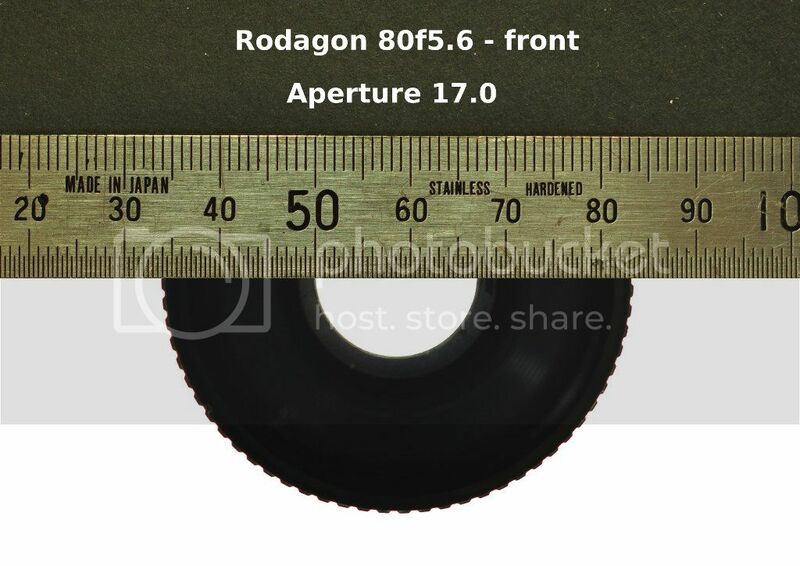 I was considering the fixed aperture in a similar lens recently (used I believe for machine printing) and wondering how to make one with a "soft" edge. I'm not one to worry over-much about bokeh, but it would be interesting. What initially came to mind was a piece of b/w film with a hole, and appropriate exposure/development around it to make a circular grey grad. But a piece of clear acetate could be printed more easily. . . .aperture. . . wondering how to make one with a "soft" edge. I'm not one to worry over-much about bokeh, but it would be interesting. Chris R, I've been thinking about something like this as well, following a conversation with Rik in which he brought up the concept of an optically soft-edged Waterhouse stop. After a bit of homework, I now use the term "apodizing stops" for such things (the phrase being well-established in some circles of photography, such as old-time large-format). When I get around to trying this, I think I'll make up a varied bunch of axial gradients around clear centers in Photoshop (should be quite easy), bunch them together on an 8x10" image, and send the file to a shop that does film printing. Should cost about $10 for a single piece of 8x10" film, which should permit a lot of experimenting. (What is the optimal clear diameter? How much margin should be used in gradient? How steep should that gradient be?) Then I can cut them out, insert in lenses, and see what is to be learned. I probably won't cut a center hole in the acetate, as in the film days, we projected or printed through acetate all the time without problem. Of course, the experiment queue is long and full of elephantine projects ); it would be great if you do this first, in which case I can save time by learning from you. 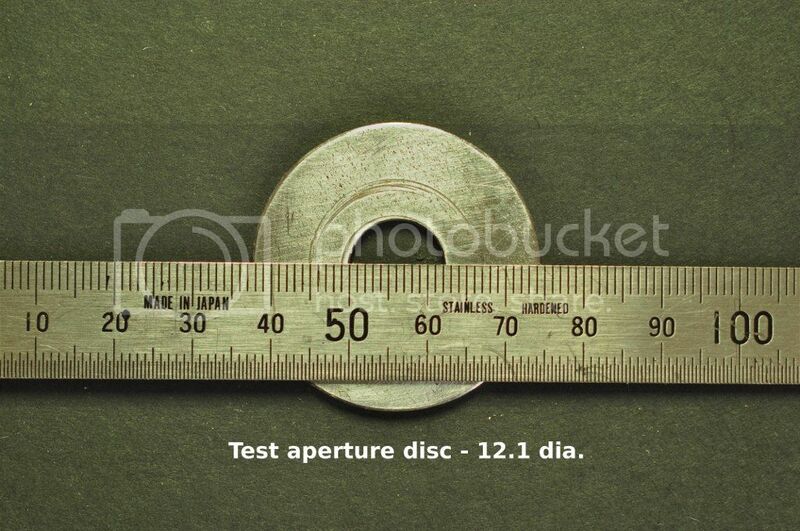 Posted: Thu Sep 20, 2012 1:11 am Post subject: Re: Calculating aperture diameter? Stick that into the lens and measure the resulting entrance pupil. How do you find the entrance pupil if there isn't an existing iris? For example, any unmounted lens from Surplus Shed. which suggests some possibilities with external stops. I hadn't thought of softening of bokeh/"aperture images" being useful in stacking. I wonder where I put that lens..
Edit - I've just found your (and a couple of other) posts containing "apodizing" in this forum - I 've been off-line quite a bit recently. Posted: Thu Sep 20, 2012 12:21 pm Post subject: Re: Calculating aperture diameter? There's always something that limits the diameter of the light bundle. With an unmounted lens, it might be just the edge of the lens. Whatever it is, use that. First step is to make a test aperture. I found a washer that was about the right size and ground down the outside diameter so that it would fit inside the lens. The hole was 12.1mm dia. Then photograph the lens each way round focusing on the aperture. For this I put the lens on a small light box on my copy stand and used a 90f4 lens wide open to make a shallow DOF image. If you have a copy stand you can measure the focus distance on the column. Then photograph a ruler at the same focus distance so the scale is exactly the same and overlay it on the lens image to measure the aperture. 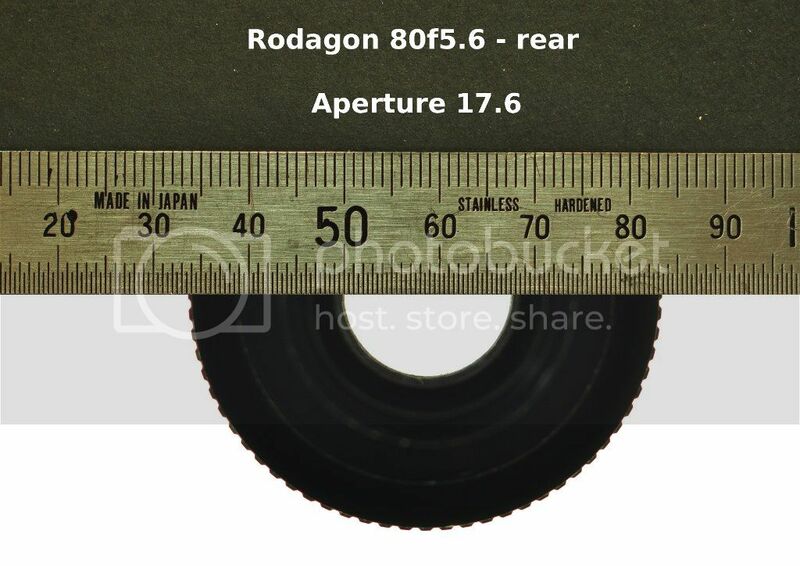 We can see that the aperture measures 17.0mm from the front and 17.6 from the rear of the lens. Now divide these by the actual diameter of 12.1 and we have a magnification factor of 1.4 on the front and 1.45 on the rear. The nearest I could find was 6.5 so I drilled it out to 7.0 which was close enough. Then to repeat the procedure with the camera still set to the same focus distance. 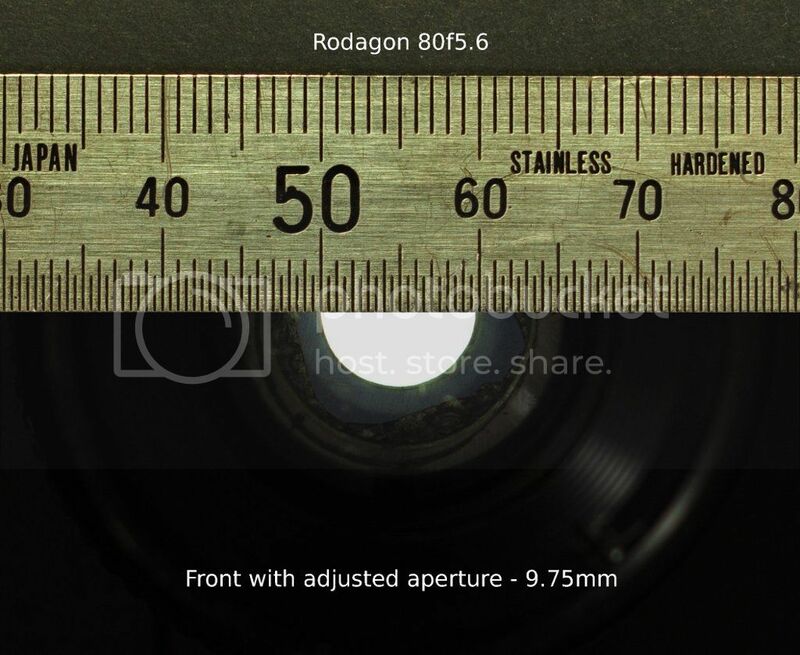 So there we have it - the aperture from the front is now 9.75 and from the rear exactly 10.0mm dia. So I can now make a proper fixed aperture out of a piece of aluminium sheet and paint it matt black and mark the lens as f8 for reverse mounting. Job done! Thanks to Rik for explaining the method. Very nice! Thanks for the feedback and illustrations. It's interesting to note that even though this lens has PMF not much different from 1, there is still a large difference between the pupil diameters and the physical aperture diameter. What we see here is typical for lenses that are fairly thick and have net positive elements on both sides of the aperture.